ArmourFloor Engineered Timber Overlay is an extremely unique and interesting product from Big River Timber. 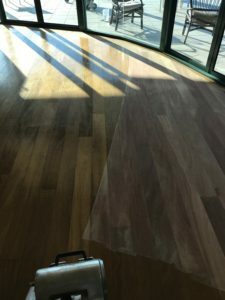 During our time as MIB Timber Floors, we laid literally thousands of square metres of it and sanded and finished the same. What makes it so unusual is the fact that Big River, peel the log to make the product. Just like unwrapping glad wrap. This creates magnificent grains. However, it also creates visible stress fractures, which some people love and others hate. It is a unique feature to this product. Floor can finish your Big River Engineered flooring in a number of ways that is highly pleasing. Every picture on this blog is the same floor. Yes, including the header title picture. It was finished in water based coating that did not protect the floor and went very yellow. We sanded it off and restored the true colour, and then protected with natural burnishing oil. The majority of ‘Professional Floor Sanders” don’t understand what Armourfloor is. Unfortunately, this leads to bad advise. 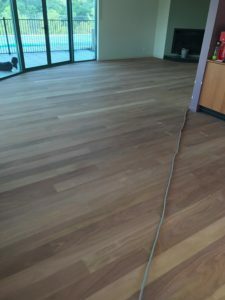 Claiming the entire floor needs to be pulled out, when in fact it can simply be sanded and polished. No matter what condition your Big River floor is in, Floor can transform it now. Armourfloor is manufactured with a 4mm veneer, so it can be fully sanded and refinished. If you finish the floor with a shiny two pack polyurethane and you don’t like the squiggles, we can trowel fill the floor to dramatically reduce the effect. Polyurethane builds depth, which creates a V shape in the stress fractures, so to lessen this effect, the floor needs to be filled and sanded back. Alternatively, we can finish in a beautiful, non-toxic burnishing oil. A true penetrating oil that will protect and enhance the timber. Natural oil will not build a skin, and therefore will not produce, or amplify the stress fractured effect. Unfortunately, unlicensed, and untrained floor sanders finished many floors. Because of this, we see many floors that are nowhere near their potential. 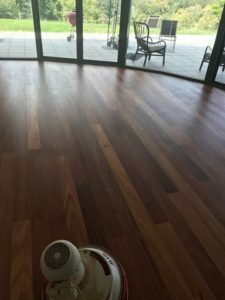 Floor can restore your Big River Timber Floors so they will look even better than they did brand new. 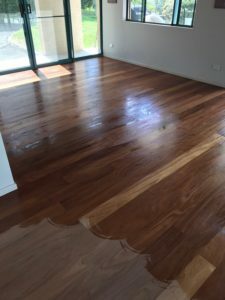 Call Mark now, to discuss we can transform your Big River Timber Floor today.